A nice meal is often more than just filling up and empty stomach, it's about an experience. From the atmosphere, to the presentation, to the food itself, every night out can be unique. From an elegant experience like South Tampa's Berns Steakhouse to a mom and pop feel at Plato Latino in North Tampa, you can try something new and totally different in Tampa everyday if you want to! About once a week, I am going to share my favorite meal of the week and hopefully provide you guys with some great places to check out all throughout the City. I've only been eating sushi for about a year, after I was convinced to try something out of my comfort zone on a trip last year. My initial thoughts: Regret..for having waited 25 years to do so! Sushi is quickly becoming one of my favorite meals(although I'm still only eating the cooked kind) , and Soho Sushi is quickly becoming one of my favorite spots. The restaurant is conveniently located off of Kennedy Blvd in South Tampa and provides a classy, but casual atmosphere. I enjoy eating sushi in small groups were everyone can choose a roll(or two) and the food is brought out on one big plate, allowing everyone to try a bit of everything. For me, trying sushi was all about trying new things so eating it family style maximizes that desire. 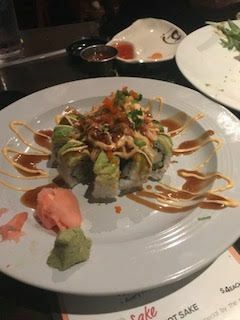 Soho Sushi is a great place for a date, or a nice night out with a small group of friends.